Alan Thicke, one of American television’s most beloved dad in the iconic role of psychiatrist Jason Seaver on the TV show Growing Pains, was born Alan Willis Jeffrey on March 1, 1947 in Kirkland Lake, Ontario. Alan graduated from the University of Western Ontario with a degree in English and Psychology. He began his career in the entertainment industry as an all-night disc jockey. His career truly began when he signed up as a writer for the Canadian Broadcasting Company. Unsatisfied with the meagre success he had achieved, he set off to the US where he was assigned to write and produce TV shows for stars like Richard Pryor, Flip Wilson, Bill Cosby, Anne Murray, Kenny Rogers, Bobby Darin, Barry Manilow and Olivia Newton-John, along with the iconic comedies America 2 Night, the NBC movie The Secret She Carried and Fernwood 2 Night. Alan received Emmy nominations, two as an actor and five as writer. He produced the NBC game show Celebrity Sweepstakes and Wizard of Odds in the mid 1970s for which he received immense critical acclaim. Thicke has written over backgrounds for 45 TV shows which include Facts of Life, Different Strokes, and Wheel of Fortune. His big break as an actor came in 1980, when hosted ‘The Alan Thicke Show’, a talk show that remains, to this day, the biggest in the history of Canadian Television. The overwhelming approval received by the Alan Thicke show led to the creation of another show by Thicke, ‘Thicke of the Night’. However, this success was short lived as the show was cancelled after losing to Johnny Carson’s highly impressive Tonight Show. However, in 1985, Alan was on back on Television, never to leave again, in the iconic role of psychiatrist and father Jason Seaver on ABC-TV’s super hit series Growing Pains. The TV show shot his career to new heights and he became famous internationally as one of American television’s most beloved fathers. The series was on air for seven years, and Thicke was awarded several awards including a Golden Globe nomination for best actor for his role. Following that, Alan underwent a serious change to alter his ‘good guy’ public image and played Dennis Dupree, a vain and pompous talk show host on the NBC series Hope and Gloria. Alan is an extremely versatile actor who has played iconic and intense roles in movies such as Obsessed, Shadow of the Bear, Any Place But Home and The Windsor Protocol. Along with his acting, he also penned two books on pregnancy and parenting: How Men Have Babies: The Pregnant Father’s Survival Guide (1999) and How to Raise Kids Who Won’t Hate You (2006). Thicke has been given the title of “Father of the year” by organizations including The Father’s Day Council of Los Angeles, The Muscular Dystrophy Association, and The Juvenile Diabetes Foundation. Alan established the Alan Thicke Centre for Juvenile Diabetes Research in London, Canada, in 1989 when his own son was diagnosed with the disease. 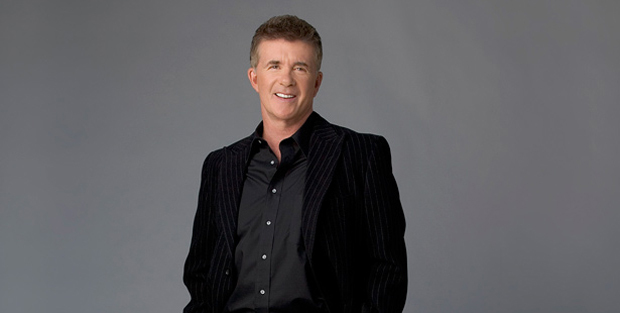 Alan Thicke has been nominated for Golden Globe and Emmy award several times for his performances as an actor and comedian.